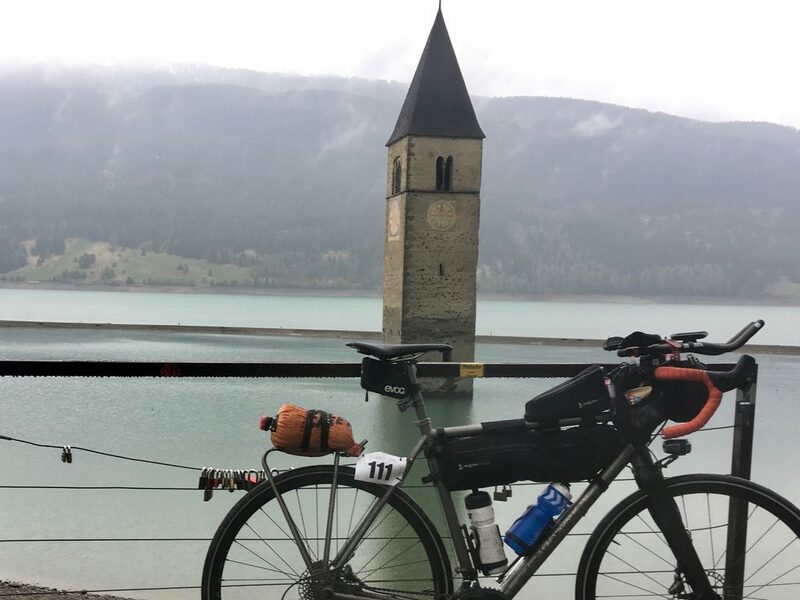 660 km across the Alps. Partly on Gravel. In one stage. Or at least that was the plan. But then it started raining. What other hardships were still waiting for Christopher and if the Rando Imperator ended well for him, he will tell you here. It’s midnight and I am shivering and freezing in the pouring rain in the market square of Bolzano and can’t go any further. It has been raining for six hours already. Sometimes more (keyword: cloudbreak), sometimes less, but uninterrupted. 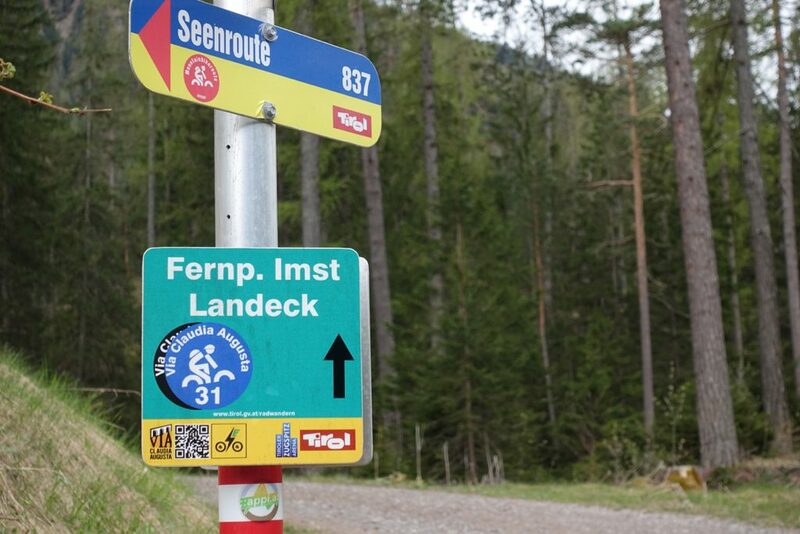 The original plan to ride the 660 km of the Rando Imperator from Munich to Ferrara in one go… I discarded it hours ago. I just stuck to the back wheel of some unknown frontman, to somehow reach Bolzano. All other thoughts I forbid myself – first of all Bolzano, how (and if) this goes on, I’ll see then. But from the beginning. 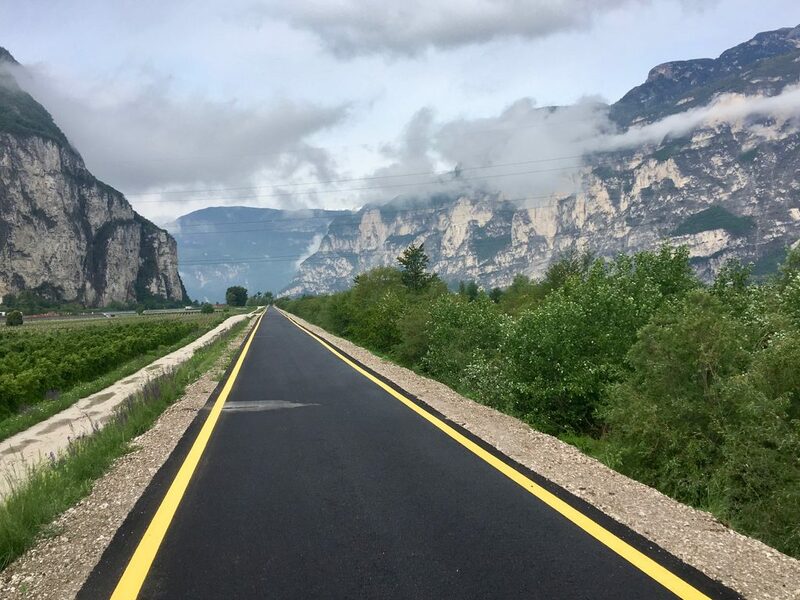 The “Rando Imperator” is a 660 km long brevet, a long-distance road bike race within a given time frame, from Munich to Ferrara, following the Via Claudia Augusta. The riders have to pass four checkpoints: Garmisch, Reschenpass, Bolzano and Mantua. In addition to a control stamp, there is also some food and comfort to keep you going. 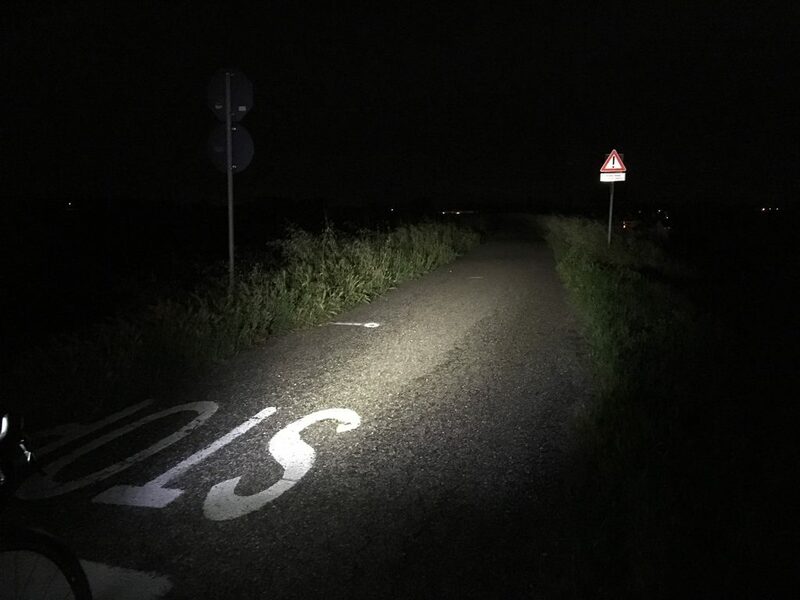 The main part of the route runs along cycle paths, small side roads and some gravel roads, but is quite suitable for racing bikes. It would be smart to install tires with a width of at least 25mm and a bit of grip. It’s a gravel ride, so just follow the recommendation by the organizer, “and it’ll be fine”. 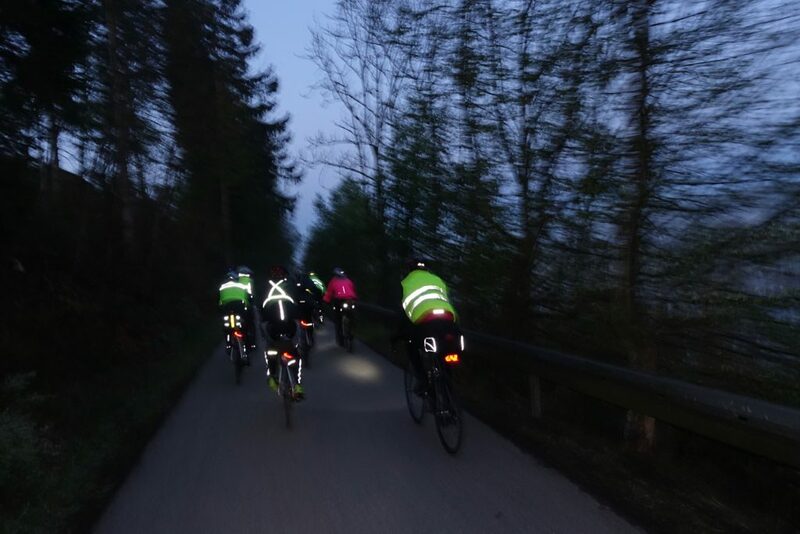 And so on the Saturday morning of this long-distance trip at half past five in the morning, 100 bikers made their way across the Alps. 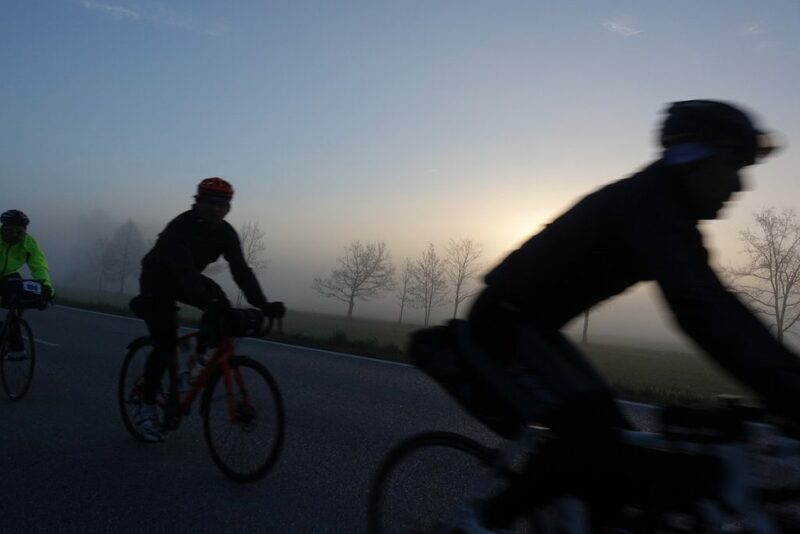 At a pinch of four degrees, it goes on the Isar bike path into the sunrise and a promising grandiose first day with the best weather. The first gravel kilometres through the Grünwalder Forst and along the Isar to Wolfratshausen the journey is still cutting through fog, then the sun sets and ensures for alpine sceneries as on a photo wallpaper. Especially along the Loisach my view always falls on the utterly beautiful alpine panorama, so time flies by on the way to the first checkpoint behind Garmisch. And thanks for that: A short breakfast with Nutella on toast and some delicious Italian ham. Strong and refreshed I take on the first real climb: the Fernpass. On the road, I would usually avoid this pass as there is just too much traffic for it to be a fun ride. At least on the street. But today I hardly have to take it to the main road. Where there is no cycle lane, the Via Claudia Augusta leads over the pass through forests. 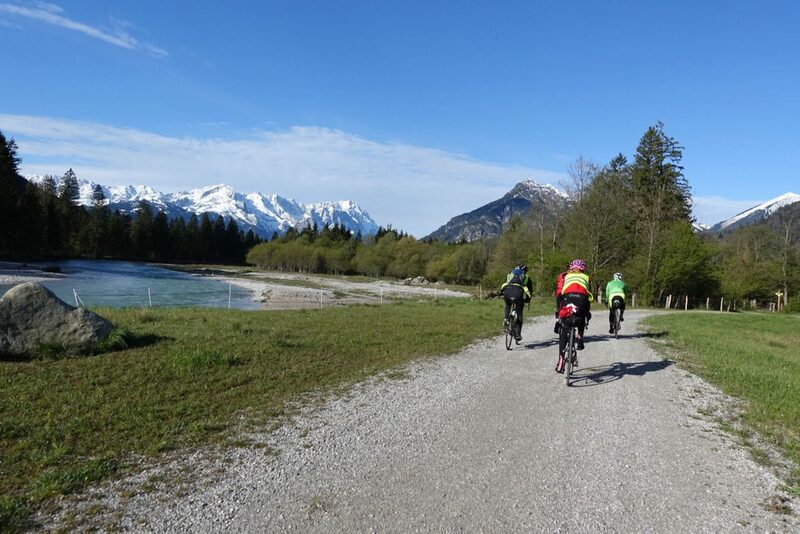 On the gravel, I feel just perfect with my 28mm tires, but since I have been riding with a few others, who only used 25mm wide tires, we took on the asphalt for the last kilometres to the pass. In addition, an asphalted, fast descent is tempting anyways. For the short stretch also the traffic wasn’t too bad and the view of the Zugspitze at the top is amazing as well. Aaand here comes the highspeed descent. Off we gooooooo! After the elevation drop. there comes the Inn valley. 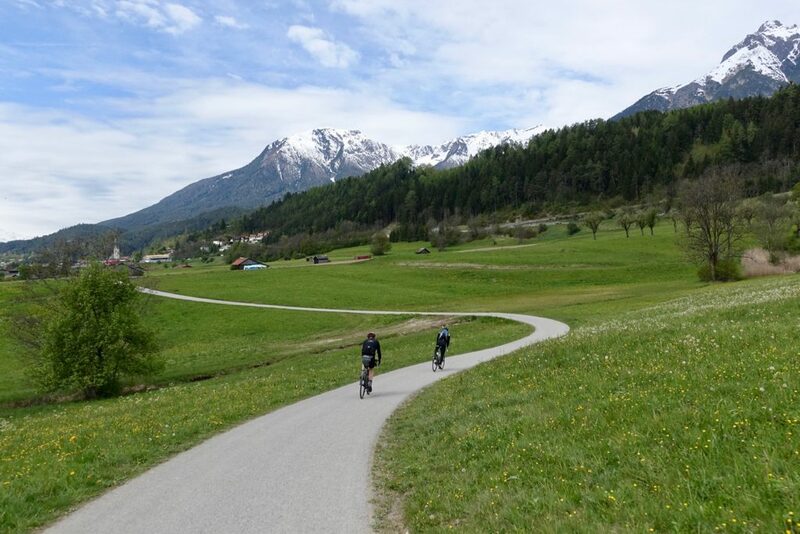 For me, this segment is one of the most beautiful part of the tour – almost completely without traffic, it follows perfectly developed bike paths in direction of the second rise, the Norberthöhe. 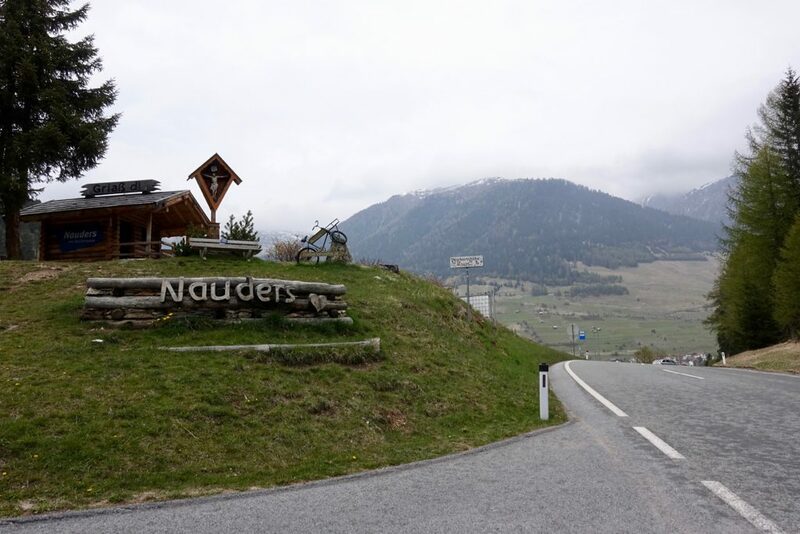 And now, after a short detour to Switzerland, I climb up the serpentines to Nauders. In principle it’s already done – I have conquered the Alps and am in the south on the other side. Ah, south – sounds so warm and sunny – unfortunately, so I realized, rain does also exist here. Oh and how much rain it can be. The drops that started to fall so gently, when I passed Nauders, quickly became more of a monsoon-like storm. 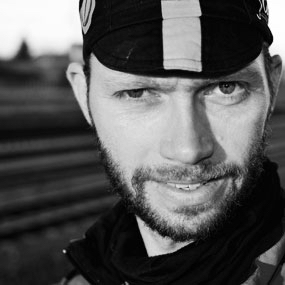 Also not a mood-brightener, the chain of my current companion Mike rips while the last ascent. After fixing that, I finally arrive wet and freezing at the next control point. The bright side though: Fortunately, it is also the first pizzeria in Italy, right behind the border. I head into the dry and warm space and order – of course – a pizza. And another one, just asdelicious and hot as the first. I make a long break here, which is tempting with that weather but not really smart, since my body cools down, while not moving. And so I hop on the road again, way too cold already and while descending I immediately regret it. The thermometer shows two degrees, it still rains and slowly it feels like my feet and hands turn into ice cubes. To get into lower (warmer) regions as soon as possible, I leave the official track and stay on the main road to be as fast as I can, without getting too much bothered by the traffic. In between, I have to stop to “warm up” again. And there suddenly a thought sneaks in: “What am I doing here?” However, to stand her is no solution, so I go back on the bike and continue the ride. The only thing that will keep me on track now: finding some other participant to follow. Sticking to someone’s back wheel and just concentrate to stay there. Because if I will stop now, I’m afraid, that I won’t continue. So it means to grit my teeth, keep the head low and grind. Occasionally, I force myself to eat a muesli bar, other than that I fantasize about a hot shower and a warm bed in Bolzano. If I were to pass a hotel right now, I’d be pretty sure I’d be weak and check in right away. But since there is nothing in the dark I stay at my companions rare wheel and finally reach Bolzano – without waving flags. In Bolzano I collect the control stamp and am off in search for a shower and bed. 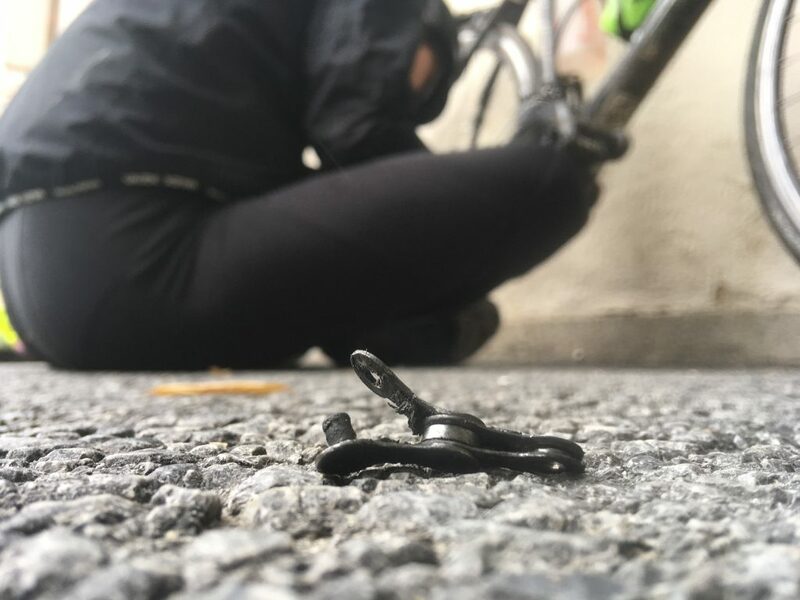 And when, just before midnight, I was standing clattering and freezing with my dirty bike in the lobby of the best hotel on the square (it was just the next) – what do you think happened? No, I didn’t get kicked out. The man behind the front desk does not even bounce: Yes, of course they would have a room for me. And the bike I shall simply put next to the front desk to the (antique!) closet. He said, that outside the bike would be stolen, so there is no discussion about that. In Italy, they might be bike-crazy but that, I didn’t expect. 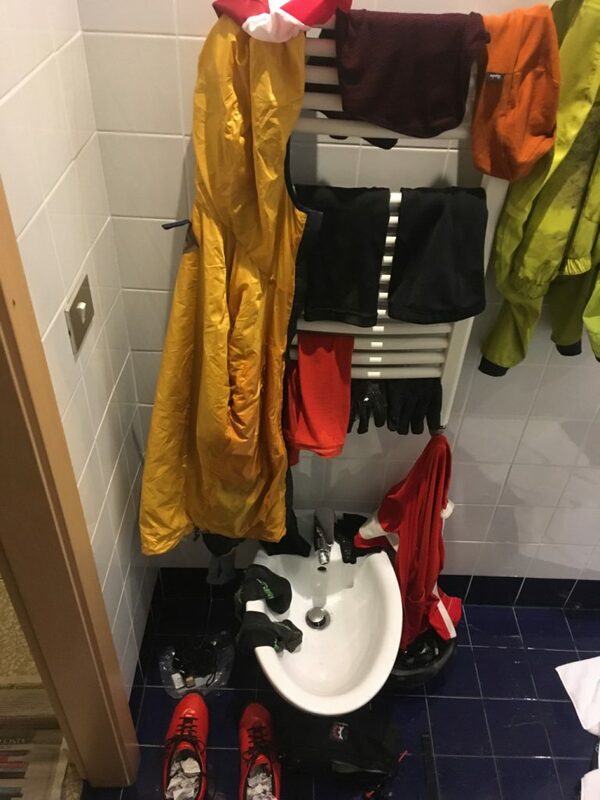 Gratefully I think no further about it and hop into the shower, my dirty clothes still on me. 30 minutes later, I lie freshly showered and stuffed to the fills (pizza, clear) under two blankets and set the alarm clock for five hours later, optimistic that by the time my next day continues. Now everything seems fine and perfect, the bad and cold memories of the last couple of hours already begin to fade away and within a minute I sleep deeply. After those few hours of sleep and a decent breakfast, the world really really much better. Every thought of giving up is wiped away. Though, a little loss: My camera didn’t survive the rain (the word “waterproof” has its limits, it seems). However, shortly before eight, while climbing uphill with surprisingly little protest of my legs, the sun comes out and I makes me feel really good again. Still 314 km to Ferrara. The cycling path along the river Adsch can be boring, kilometers and kilometers, only along the river, no gradients, no variety. 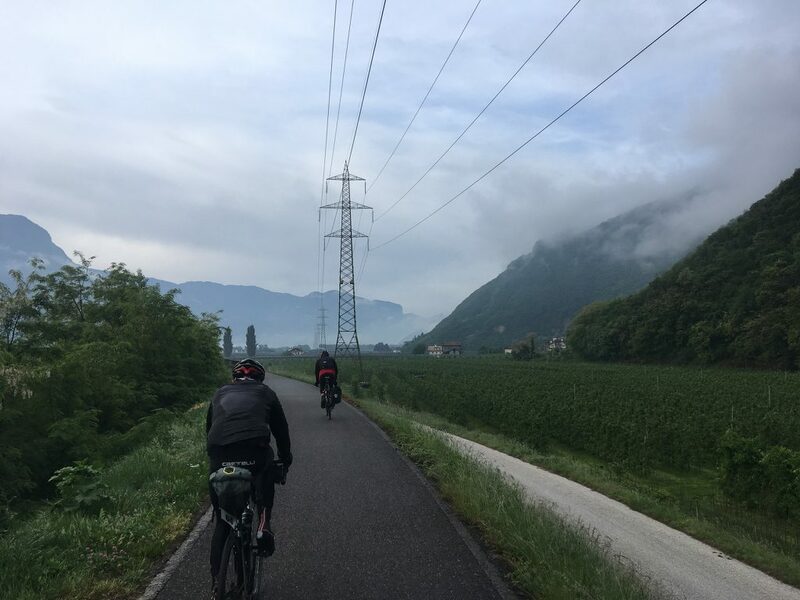 But who am I to complain, after yesterday’s tour I can be glad that it’s so easy, plus I even have company: Bernd and Carsten have also stayed in Bolzano and so we tackle the second day together. Not only the occasional wind shadow motivated, but also good discussions about cycling make the ride real joyful. 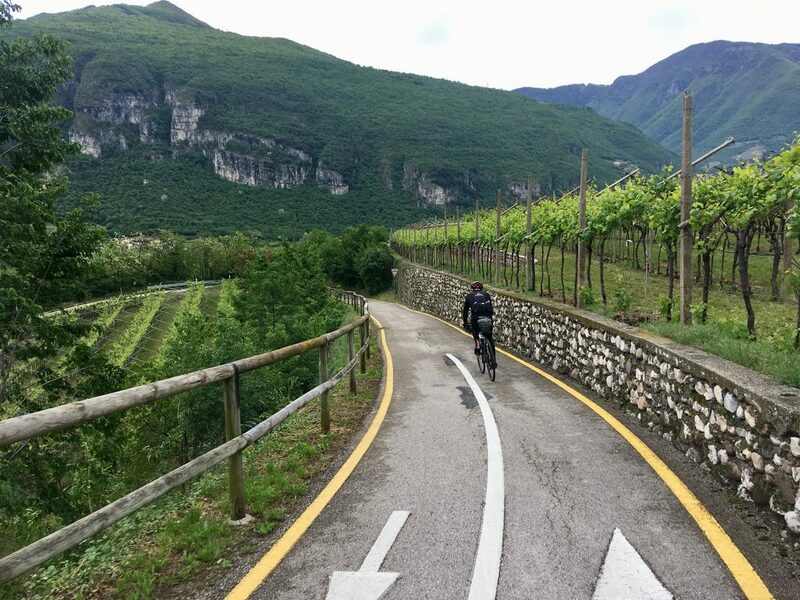 Shortly before Lake Garda, there are few ups and downs of elevation through the vineyards, a last short reminder that I just crossed the Alps. 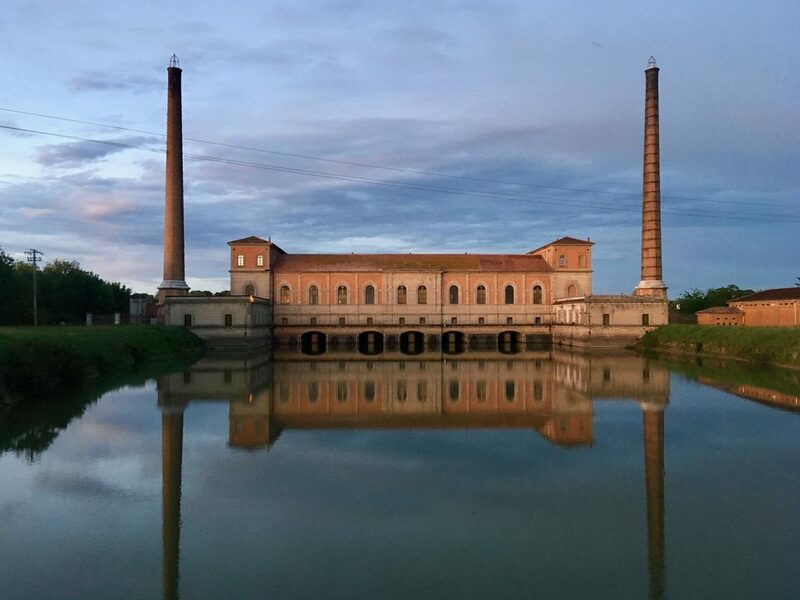 The three of us roll into the bottom of the Po region and go to collect the next control stamp in Mantua. Now there is “only” 100 km of road left along the Po – and it’s flat like a pancake. I already can smell the final destination, Ferrara. Slowly but steady I feel I’m reaching my limits. I don’t want to pedal anymore, neither I want to sit on my bike. 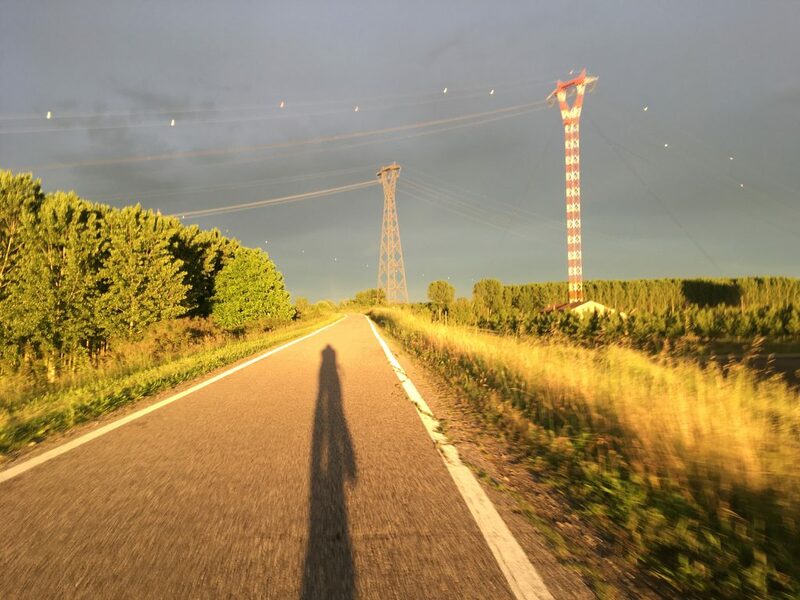 Rain and wind would be a killer right now but I am lucky: a light backwind pushes me towards the Ferrara and so I can enjoy the ride on the dyke in the beautiful sunset. The area here looks like an Asterix comic, all very Roman, and I would not be surprised if Obelix came out of the woods, herding a troop of Roman legionaries before him. 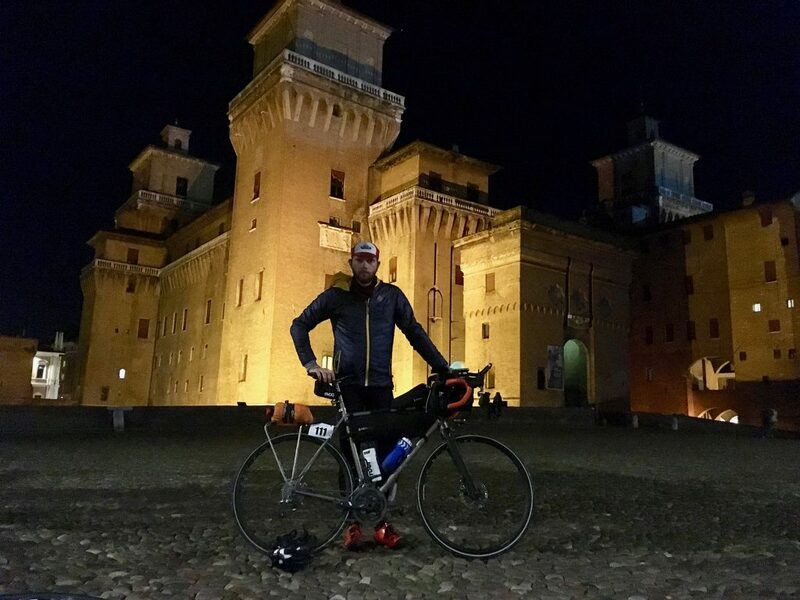 But in the end, no one blocked the streets and so I reach Ferrara after 42 hours and 665 km: Tired and k.o., but moreover happy and proud.